Dark Fishing Spider, Dolomedes tenebrosus (Nursery Web Spider family, Pisauridae) eating a fly at the bottom of a plastic pitcher. I discovered this scene as I was placing the pitcher under an apple cider press to catch the soon to be pressed cider. I'm glad I did. 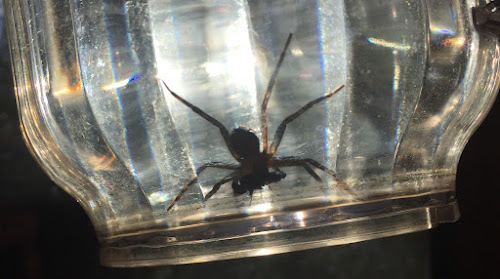 Not only did I save this arachnid from a fruity deluge, but I also got to share it and my excitement with the group of kindergarten students who were with me at the time. Dark Fishing spiders are fairly easy to keep in a small terrarium. To set the terrarium up, I use a moss or soil substrate, with a piece of bark or some other natural object as a hiding place. I mist the terrarium every day or two, making sure there are some droplets low on the sides for drinking (a shallow dish or lid could work too). I feed small to medium-sized crickets to the spider once or twice a week. After a month or two of observation, you can always let it go back under whatever sink or damp corner you found it in, if it doesn't get away first.